I am a very proud Man of Kent, and just wanted to point out some of the excellent paranormal, weird and interesting resources and stories out there devoted to my favourite county. Historic Kent has a really good section on some of the outlandish stories from around the Garden of England... including an excellent article on a story from Folkestone, the town I consider home. It's all about a case of Spontaneous Human Combustion, and it's very in depth for such a small story. Then there is Haunted Kent whose title is pretty self explanatory! Then there's the Essex and Kent Paranormal Research Society. All very interesting. We have plenty of ghost of ghost stories but none quite as famous as the Blue Bell Hill ghost. Kent Big Cat Research is our source for news and information on the hunt for the big cats in Kent and around the country. "As we came together we will also go together"
She passed away 6 hours later. 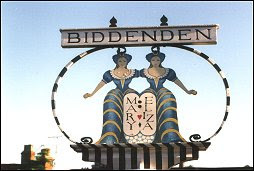 There are a few ghosts story associated with the Maids of Biddenden but I think their story is interesting even without a ghostly connection. Then we have the giants... no not members of my rather tall family (I myself am 6'8")... but the East Kent Giants of which you can find out more on this web page. Those are mistaken who found this Proverb on a miracle of Austin the Monk; who preached in an English village, and being himself and his associates beat and abused by the Pagans there, who opprobriously tied Fish-tails to their backsides; in revenge thereof such appendants grew to the hind-parts of all that generation. For the scene of this lying wonder was not laid in any part of Kent, but pretended many miles off, nigh Cerne in Dorsetshire. I conceive it first of outlandish extraction, and cast by forreigners as a note of disgrace on all English men, though it chanceth to stick onely on the Kentish at this day. I have no doubt this was a popular idea among our French friends, whose proximity to Kent has meant a close, if sometimes sarcastic, relationship. They say we have tails and we say they are frogs. It all works out in the end. Although nowadays they like to call us Ros Bofs. Hilarious. NOT. So that's just a taste of Kent for you, and I'll probably expand upon some of these stories and others in the future. Mothman? In Kent? Please do a follow up on that sometime in the future. That would be very interesting. Is there such a thing as a "Weird Kent" tour? If there isn't it sounds like there really should be one. Oh don't worry most of these stories will be looked into in more depth... I apologise for my Kent-o-centric outlook... I'm just a Kentish boy and proud. Polar Bears: Cute But Not For Cuddles! Dinosaur Survival In The Americas?